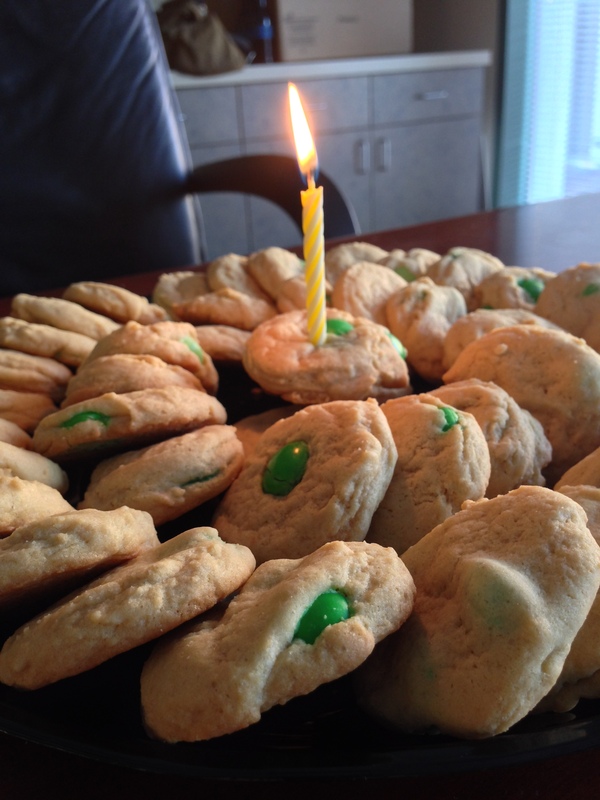 Today is yet another Ciatti birthday….Happy Birthday Chris Welch! Last year I asked Chris what his favorite dessert or dessert flavors are. His response? Mint chocolate chip. Last year I made M&M Chocolate Chip cookies and sandwiched Mint Chip Ice Cream between the cookies. Man, were they a hit! This year, I wanted to stick with the theme. I decided to make mint chip cookies. Three different stores later…and not one carried mint chips. Can you believe it?! Change of plans. 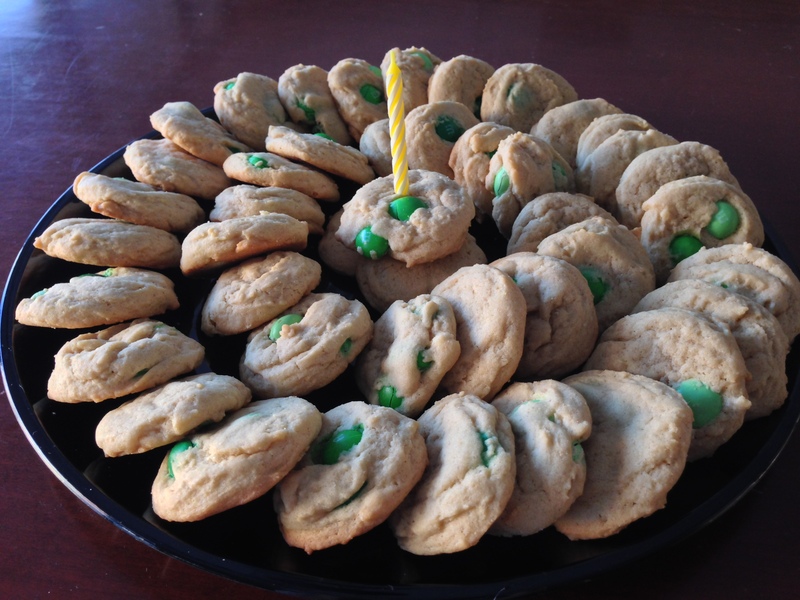 Mint M&M cookies! * Note: I like my cookies less sweet, so I added 1/3 cup sugar. The original recipe uses 1/2 cup sugar, so feel free to add a bit more if you like sweeter cookies. In a medium bowl, combine flour, baking soda, cornstarch, and salt. Set aside. In a large bowl, beat butter and both sugars until fluffy (approximately 5 minutes). Beat in egg, egg yolk and vanilla. Mix the flour mixture into butter mixture (I mixed in a third of the flour at a time). Be sure to scrape the sides of the bowl and mix well. Fold in M&M candies. I used almost the whole bag, which ended up being 2-3 M&Ms per cookie. Scoop a tablespoon of dough onto the prepared baking sheet (I used a 1 tablespoon cookie scooper). Bake at 350 for 9-11 minutes or just until they start to lightly brown on the sides. Let cool on pan for 3-5 minutes. Transfer to a wire rack. ENJOY! The original recipe estimated 2 dozen cookies. However, I made about 40 cookies with the 1 tablespoon scooper. 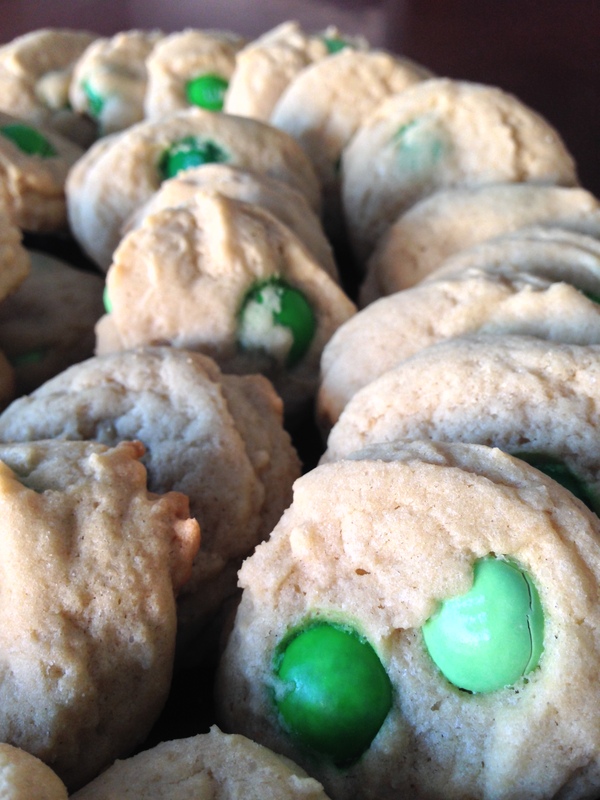 Soft & Chewy M&M Cookies Recipe adapted from On Sugar Mountain.